There are many things you have to consider when you design levels for a mobile application. You need to start off with easier levels and then increase difficulty along the way so that the player does not realize it too much, but still feels challenged. We do not want the solution to be simply a result of brute force. That is why we tried to put a little trick into every puzzle. This way the player can always just start walking or think one moment about our intentions and solve the level much faster. The first thing should always be the thought about where the star should end up. Sometimes you have to think backwards to find the right path. Another important thing for us was the uniqueness of the solution. If a puzzle is ambiguous it is more difficult to find the solution because there is no clear argument why you should take that path. But that also made it harder for us to design. Most of the levels had to be solved several times, many small changes had to be made again and again until we finally liked them. 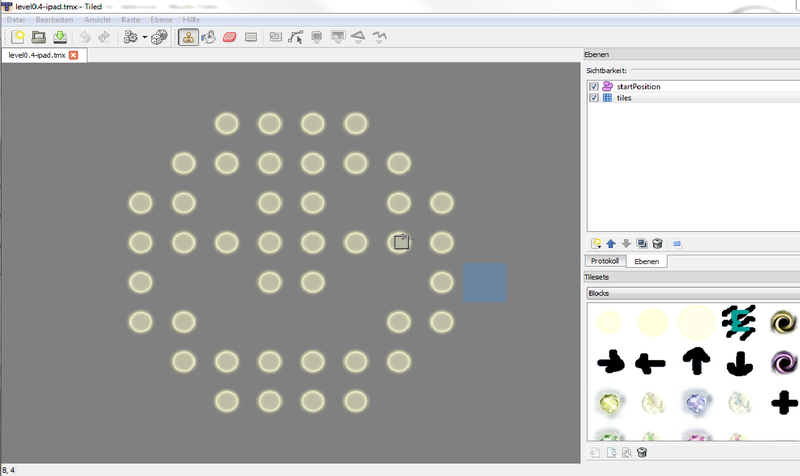 When we are finished designing a level, we use the editor “Tiled” to insert it into the game. In this editor we got the tileset with the most recent design. We can specify the size of each puzzle, where which tile goes and also the starting position. This is a very easy process, that just needs some concentration and time. On the left you can see what this looks like. As our star has only one night to become sparkling, we wanted to show you this night in the menu. Therefore we choose a black landscape with a tree, where the skyline will change from sunset at the earlier levels to black night and then sunrise at the end of the game. 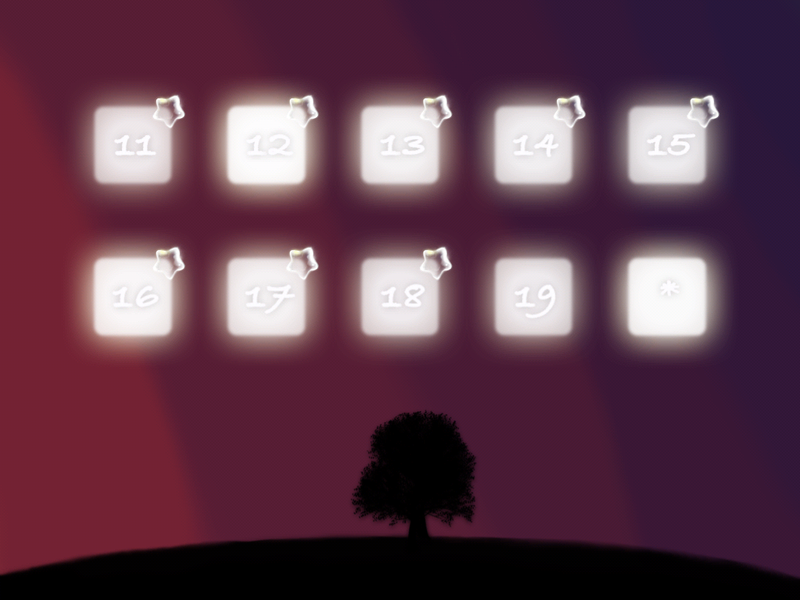 When you start a level, the background slides upwards. The effect should give you the impression of looking up to the stars high in the sky. 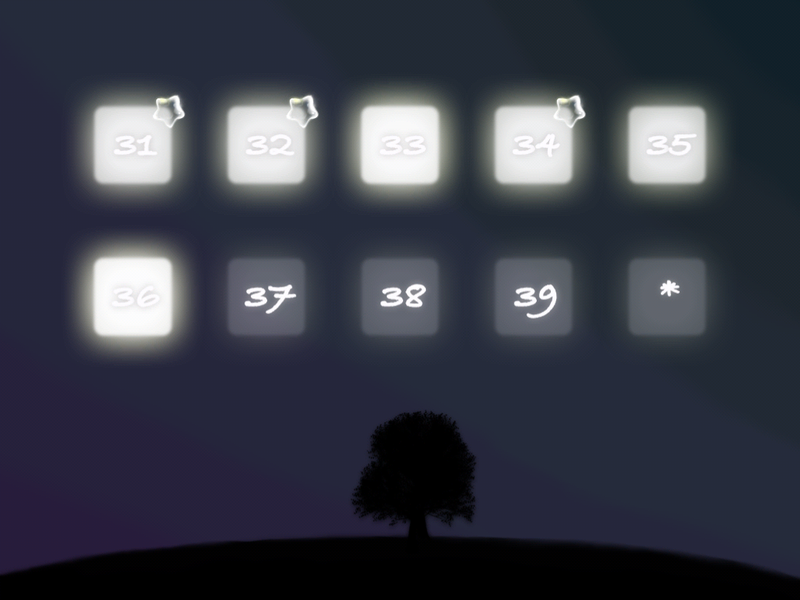 The level selection is visualized by 10 gray fields with a bright number. Those represent the locked levels. If you unlock a level the field becomes luminous. Again, once you cleared it a little star apears in the corner. Altogether we tried to make the menu look calm and comfortable, like a warm summer night. This entry was posted on November 25, 2012, in Game Design. Have you ever wondered what a computer science Ph.D., two students of mathematics and a student of mechatronics do in their free time? Programming their own iPad App it is! As spare time is boring anyway, we thought we could work a bit more and decided to make our own game. We all agreed that it had to be challenging, but meditative and of course addictive. But most importantly, it had to have a cute main character. And so our little star was born! 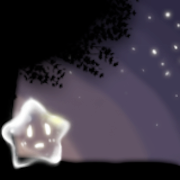 Although we made him the cutest star in the whole sky, he is not quite happy, because he does not yet sparkle like the others. So his goal is to collect as much light dust in one night as possible to become bright and shiny. How exactly does he do that? 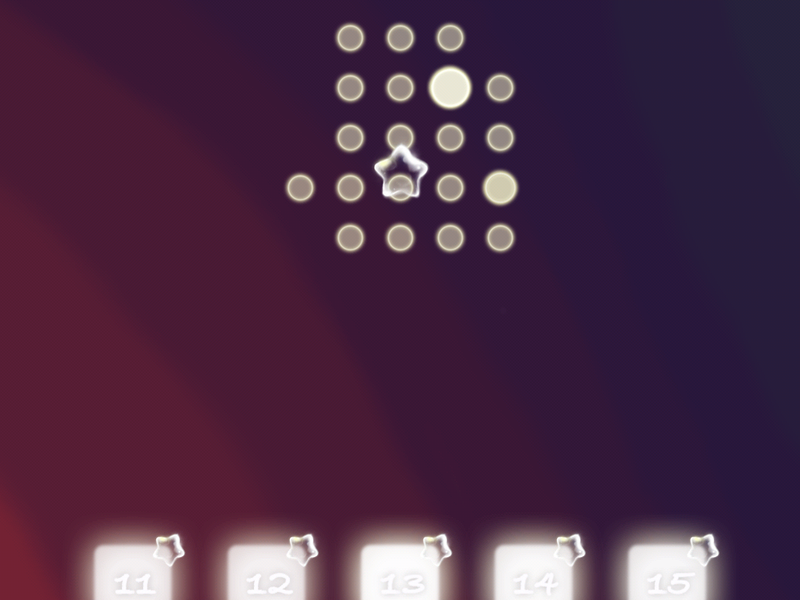 In each level there is a grid of light balls. To clear it you have to walk onto every single tile at least once. The difficulty is to choose the right path. Most of the levels have only one solution. To make it more interesting, we also thought of several additional tiles, which we will tell you about in detail later. Excited as we were about this first idea, we started right away. Barbara takes care of programming. As the game is for Apple products, she uses Objective C. The Code will be open source when we are finished. Helen is our artist. She makes the star cute and let our little world sparkle. Florian is the one you have to complain to if the levels are too hard. As our puzzle master, he has to approve of every new level before we add it to the game, to ensure that there is a nice solution. 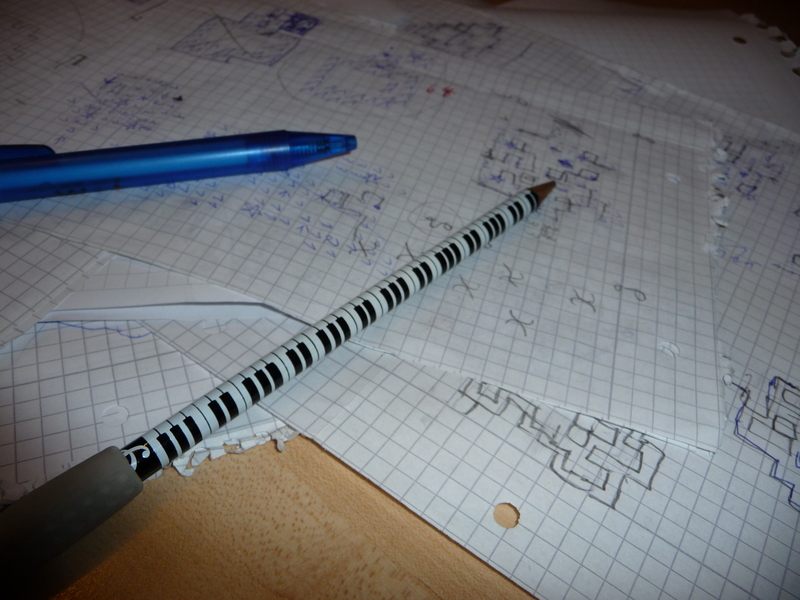 Agnes designs the easier levels that teach the player the game. She also makes sure that everyone is doing his job. But most of the big decisions are made in group. We also find our inspiration together. In the next entries, we will tell you more about the design of the menu, the look of the tiles, how we make the levels and of course our little star. This entry was posted on November 20, 2012, in Game Design.